J.P. Cooper says that Schnackenburg continues to send contributions to him, and Mr. Cooper is happy to be an instrument in the transaction. He says that acknowledgment should go to Schnackenburg. 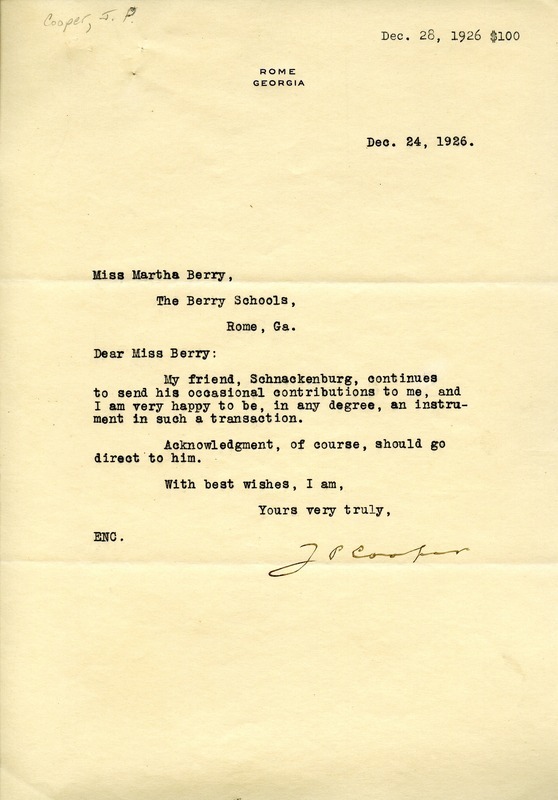 Mr. J. P. Cooper, “A Letter to Martha Berry from J.P. Cooper.” Martha Berry Digital Archive. Eds. Schlitz, Stephanie A., Maggie Holman, et al. Mount Berry: Berry College, 2011. accessed April 25, 2019, https://mbda.berry.edu/items/show/1149.